The new scooterette in the TVS Scooty lineage 'Scooty Streak' looks mature, attractive and has got some added features for customer's benefit. Read the review to know the features, technical specifications & price in India. TVS has given an upgraded version of Scooty to all its customers who were looking for a much matured feminine version of a Scooterette. The black colored streak has come out with some beneficial features like the petrol tank fuel fill inlet is provided at the rear end and outside the seat (not beneath). Scooty Streak also has a mobile charging unit provided within the glove box at the front. Scooty Streak is ready to popup the hearts of many women with its ravishing looks carrying a baggage of safety and other features in its large store space underneath the seat. TVS Scooty Streak is run by a single cylinder which delivers output in four strokes. The engine is cooled by air and it is light in weight. The 87.8 cc engine gives a maximum torque of 5.8 Nm when it runs at 4000 rpm. The maximum power output of this engine is 5 bhp and this is attained at 6500 rpm. The engine runs smoothly and at descent speeds. The brand has carried this reputation in this fact from all scooterettes that it brought into the market previously. 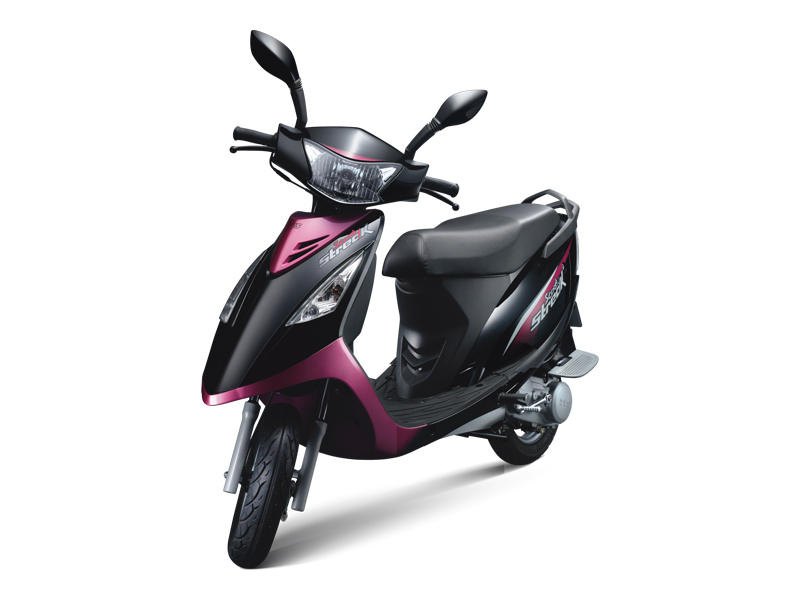 TVS Scooty Streak has come out with some fine graphics over the body and they picture out each emotion of a feminine gender in different colored themes. The rear of the Streak is fit with an LED as tail lamp. It is integrated with the indicators and this tail lamp unit makes Streak attractive from a look from behind. The seat of Streak is made of MDI Polyurethane foam which is well known for its softness and resilience. 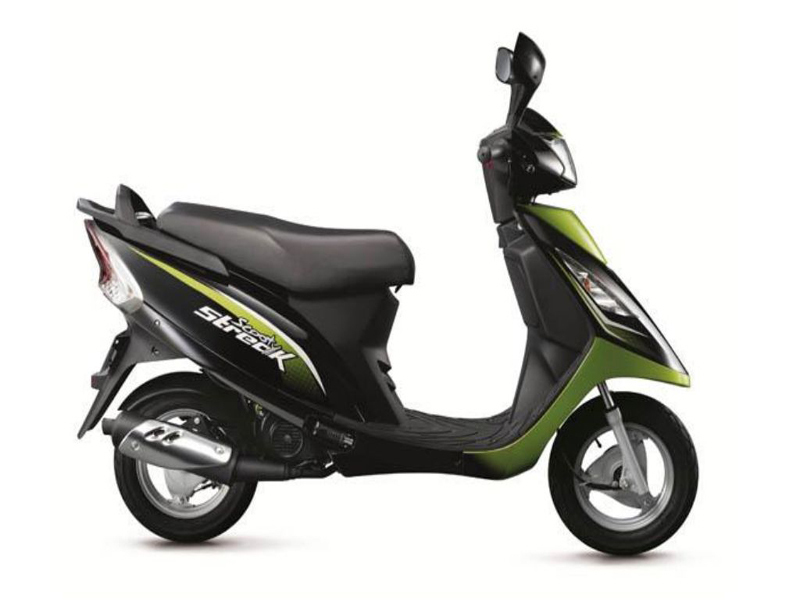 TVS Scooty Streak has some of the technical features to provide better riding and handling ability. The telescopic shock absorbers of Streak are made of cast aluminum that provide better control and comfort while riding. The tread over the wide tires are designed in a unidirectional manner to provide an anti-skidding effect during the ride. The vehicle is light in weight and even the engine is built the same way in order to be able to handle easily. 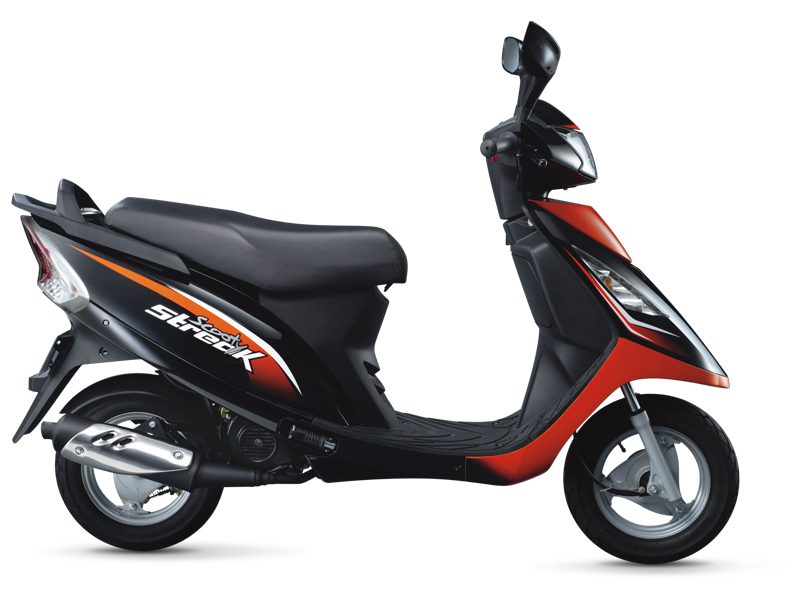 Scooty Streak can run from 45 to 50 Km/lit under normal riding conditions within a city. The engine of Streak is also built a manner to provide better fuel efficiency. Scooty Streak is available in five different themes of colors over black as base color. The names of the themes reflect different emotions of a female. Violet Pride, Pink Lust, Red Red, Orange Greed and Green Envy are five different colors of Scooty Streak over a black base.